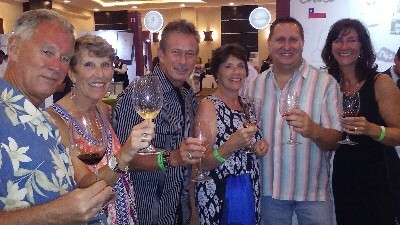 Recently, Felipe Motta held its Gran Feria de Vinos at the Hotel Riu Plaza. This annual 2-day event attracts hundreds, possibly thousands of wine aficionados, wine drinkers and partyistas. Although held in a huge room, it always fills up and becomes more party and less serious wine tasting. After a certain point, the people watching becomes the main attraction. That’s why I always arrive early; I can taste before the crowds arrive and have an opportunity to chat with the representatives of the wineries pouring their wares. This year was no exception. The crowds were there and the noise level grew and grew. It is Panama, after all. By all accounts, it was a great success for all concerned. As always, there were also several large groups from the beaches. Usually, I choose a theme to focus my tasting. This year I concentrated on Argentina and Spain, with a few side trips. And, as a seasoned professional, of course I always spit. I believe I was one of the few spitting. Everyone else seemed determined to get their money’s worth by consuming as much as possible. Although I take detailed tasting notes, I abbreviate them here and offer a few recommendations. Felipe Motta carries some or all the below mentioned wines at their Felipe Motta Wine Stores. If you can’t find them at your local store, they can be ordered and should arrive in a week or so. Bodega Del Fin del Mundo, Patagonia, Argentina. Reserva Malbec, $19.50 Lots of fruit. Very rich and clean. Nicely balanced. Special Blend, $43.50, 40% Malbec, 40% Cabernet Sauvignon, 20% Merlot. Dark, rich with hints of mint, chocolate and berries. Susana Balbo Wines, Mendoza, Argentina. Crios Torrontes, $8.75 Lovely white with bright fruit, dry and rich finish. Crios Rose’ of Malbec, $8.75 Super wine with lovely fruit. Dry but nicely balanced. Always a favorite. Cabernet Sauvignon, $21.25 Also a favorite and great value. Deep cherry and berry fruit. Brioso, $33.35 Another value, even at this price. Blackberry, plum, licorice and cassis. Viognier, $13.00 Lovely, clean, dry with bright fruit. Pineapple, spice and earth. Malbec, $12.50. Dry with nice rich finish. Berries and oak. Cabernet Franc, $18.75 Hints of olives and herbs. Unusual grape for Argentina. Primeras Viñas Malbec, $37.50. Wow! Still young but will be great soon. From vines planted in 1906. Very serious wine. Ripe with red and black fruits, oak, spice blackberry and flowers. Very complex. Protos, Ribera del Duero, Spain. Roble, $13.25, 100% Tempranillo. Easy to drink, nicely balanced with good fruit. Crianza, $24.00, 100% Tempranillo. Beautiful nose. Still young but very promising. Reserva, $38.00, 100% Tempranillo. Very dark with complex flavors. Spicy, chocolate, cigar and earth. Long finish. Gran Reserva, $61.00, 100% Tempranillo. Super wine! Still very young and intense. Produced only in special years from vines 60 – 80 years old. Already showing the promise of a great future. I fell in love with these wines and will take the opportunity to write about them separately at another time. But be on the lookout for them. M. Stefan has over 30 years experience in the wine trade and has traveled extensively throughout the wine-producing regions of the world. His column is a regular feature of La Playa Community. He can be reached at markken53@gmail.com and appreciates your comments.